When combined with an agile work environment, unified communications can help transform your organisation. The use of unified communications in an agile working environment can transform your business results says John Brett, Technical Operations Manager of Nexus Open Systems. Today’s business world is increasingly competitive and organisations need to be able to adapt to the complex, performance driven landscape in order to succeed. The relationship between a business and its workforce has changed dramatically in recent years as todays employees increasingly place greater emphasis on work/life balance and health and wellbeing. Employer flexibility is no longer viewed as a benefit but has become an expectation of employees while it is increasingly accepted by many that much time spent at an office desk is unproductive. Indeed, a recent survey conducted by Randstad revealed that 81 percent of those surveyed recognised that working flexibly had a positive impact on their commitment and overall productivity. Agile working has become a more familiar term in the UK as it gains popularity across many high-profile organisations. Business leaders have begun to recognise that the traditional nine to five office environment is often detrimental to productivity and the idea that one must be present at a desk for long working days is becoming increasingly outdated. Agile working is often confused with flexible working but the concept and scope is much broader and often difficult to define as it can be delivered in many different forms. The Royal Institute of Chartered Surveyors (RICS) describes agile working as work being “an activity, not a place” as the focus is entirely results based rather than subject to physical presence Agile working empowers people to work how, where and when they choose offering employees the maximum level of flexibility to deliver results without the constraints of fixed daily and weekly office hours and locations. Agile working can be remotely or office based and agile office spaces are being seen more frequently with break out spaces, hot desks and rest areas in place of traditional desk banks. Whether office or remotely based, the ethos of agile working remains the same with the focus on delivery of results and overall performance rather than conventional measures of success such as time and attendance. Location of staff is not an obstacle and rigid management is counterproductive in an agile environment. Most employers in the UK offer flexible working policies but agile working options remain less common. This is a trend likely to change however as many companies are beginning to recognise the numerous benefits to both business and workforce of adopting an agile culture. The benefits of this style of working for employees, are in line with those noted for flexible workers mainly surrounding enhanced work/life balance, stress reduction and increased wellbeing etc but It is the benefit to business results that agile working can provide that is making employers take note as many agile businesses reap the rewards. Organisational agility is critical to business development and ultimately, business success. It provides employers with the potential to offer improved lifestyle choices to staff while reducing operational costs. The ability for businesses to fully incorporate agile working practice is made possible with the incorporation of progressive, empowering technology. Technology removes boundaries, making it possible for employees to perform their role anytime and anywhere. Adopting an agile working culture requires communication tools and information technology which enables people to work in ways which best suit their needs eliminating the traditional limitations of physical location to perform a task. Business leaders are increasingly recognising the benefit of adopting Unified Communications (UC) strategies which are of particular advantage in agile working environments. UC is an enabler, allowing employees to increase productivity through effective communication and advanced collaboration. They integrate real-time communication services including instant messaging, voice and video conferencing and presence information with non-real-time communications such as email and voicemail in a seamless, intuitive user experience. UC can dramatically improve both external and internal communications in office and in remote working situations. Internally it allows individuals to view the real-time status of colleague’s availability, increasing the ability to choose the most efficient form of communication for current tasks and reducing wasted time scheduling. Presence information is displayed consistently across various applications, providing an up to date status view of colleagues’ availability. UC solutions offer a range of advanced telephony functions including short number dialling, call forwarding, multiple device rings, single numbers for multiple devices, unified voicemail box, cheaper calls, simplified billing and presence. The freedom to communicate in this way is ideal for agile workers who do not require a fixed office desk or location in order to communicate effectively and deliver results. Employees can access company business systems via intranet from any location and communicate effectively with colleagues and third parties through a multitude of devices including smartphones, PCs, laptops and tablets. 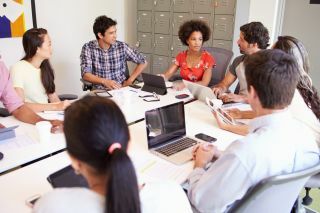 The impact on an organisation that adopts an agile working policy with the support of unified communications can be dramatic by enhancing individual productivity, promoting trust relationships, increasing staff engagement and retention, and by enabling substantial cost reduction in terms of facilities, building, travel, parking and office space. Many organisations currently work with a series of legacy systems which do not complement other in-house programmes but by replacing these with one single solution which can communicate and collaborate effectively across a variety of channels, organisations can enjoy substantial cost savings rapidly providing a return on investment (ROI). The incorporation of an agile workforce supported by suitable investment and commitment in UC certainly has the potential to revolutionise the traditional office environment. Not only can an agile approach engage the current workforce but the adoption of agile working supported by UC also has the scope to address skill shortages by enabling companies to attract talent beyond geographical limitations removing the need for physical relocation. Employees are empowered to create their own work environment where and when they need, working at their most productive time of day and delivering optimum results. By empowering employees to create their own schedule and investing in the technology to deliver, organisations can enjoy extended business hours, increased staff engagement, reduced cost base and enhanced overall performance. With the opportunities that technology supported agile working can provide, this is a business trend which looks to become a necessity rather than an option.